/ Wishing You Could Dine Out With Your Dog? You Can in Las Vegas! Now You Can Take Your Dog and Have Your Cake Too! How many times have you taken your dog for a walk or been at the park and wished you could stop in at a local restaurant and take your dog in with you? Well, you’ll not have to wait any longer if you live in Las Vega. Health officials there are waiving some restaurant regulations to now make it possible for food establishments to dog friendly outdoor patios for you and your pooch. Hopefully, this move will catch on at many other cities as well. Here’s the scoop as reported by Jackie Valley with the Las Vegas Sun. Dog lovers, rejoice: You may not have to part with your pooch to dine at Las Vegas Valley restaurants. The Southern Nevada Health District began offering “dog-friendly patio waivers” in June, prompted by Lazy Dog Restaurant & Bar’s entry into the market. The California-based eatery, which opened a location at Downtown Summerlin in April, features a lodge theme inspired by the founder’s memories of a “lazy dog” stretched out by a fireplace in Jackson Hole, Wyoming. 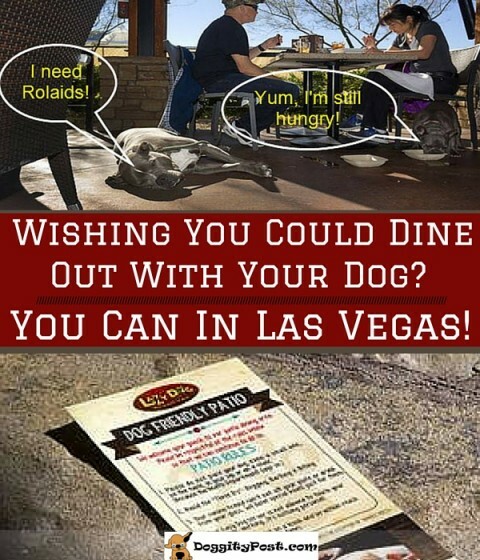 What county health officials didn’t realize: The restaurant chain welcomes canines to its outdoor patios and had intended to do so in Las Vegas as well. “I guess we didn’t think to ask the question,” said Paul Klouse, environmental health manager at the Health District. The dilemma led to the health district tweaking its waiver process to include dog-friendly patios, Klouse said. The Environmental Health Division can issue waivers from regulatory requirements — such as no animals on the premises of food establishments — if the division and restaurant can agree to modifications that won’t pose a health hazard or nuisance. In this case, that means restaurants must adhere to a strict list of rules, most of which pertain to sanitation. For instance, dogs must enter patios through an outdoor gate and remain on the ground. And if nature calls, rules exist for how restaurants must handle animals’ feces and urine. “We work with applicants to try to meet their needs while meeting the regulatory requirements,” Klouse said. The bottom line, however, is ensuring the patio space is as clean and sanitary as it would have been without dogs present, he said. The waiver process costs restaurants $118. In addition to Lazy Dog Restaurant & Bar, the Health District has approved waivers for dog-friendly patios at four Egg Works locations, Egg & I and the Mt. Charleston Lodge, Klouse said. He expects to receive more waiver applications as word spreads. Klouse admits some Las Vegas Valley eateries likely have been allowing dogs on patios despite being in violation of health regulations. Health district employees plan to alert those businesses about the waiver opportunity, he said. It’s not a new concept. New York and California recently passed legislation allowing canine companions on restaurant patios. Phil McMaster, general manager of the Lazy Dog Restaurant & Bar in Downtown Summerlin, said the patio has proved popular — both with dogs and their owners — in Las Vegas. When nice weather coincides with brunch hours on the weekend, the restaurant’s large patio has hosted upwards of 25 dogs and their families at one time, creating waitlists for other patrons visiting with four-legged companions, he said. “So far, it has been a very powerful thing for the community,” he said. A bonus for the dogs: a menu designed just for them with entrees such as a grilled hamburger patty and brown rice ($4.95), grilled chicken breast and brown rice ($4.95) and plain brown rice ($1.95). Lazy Dog also provides complimentary water — in bowls, of course. The restaurant’s outdoor patio contains signage reiterating the rules and asking canine patrons to avoid the “Three Bs” — begging, barking and biting — but McMaster said most dogs mind their manners. The patio hasn’t experienced any doggy brawls, just some excited barking every once in a while, he said. “It’s nice they’re able to come to the restaurant, sit down and have a nice meal,” McMaster said, referring to both dogs and their owners. And just to be clear: They’re called “dog-friendly patio waivers” for a reason. No other animals are allowed. “It’s much easier to control a dog than a cat,” Klouse said.